Click on one of the links below to add your own review. We have now returned from our honeymoon and wanted to say a HUGE thank you for your services at our wedding on April 26th at Mansfield. We thought you did anabsolutely fantastic job. We loved every minute of the wedding as did the guests and hope you enjoyed it too. Everyone has been commenting on the great choice of music and the dance floor was packed. We really couldn't have asked for anything more. We had an absolute ball - you were fantastic and everyone has been raving about how great you were - we're still on a high and can't thank you enough. It was a brilliant night… even without Danny and I filling in requests for ourselves. Actually I can't say enough good things about you! A million thanks once again for helping to make our wedding such an amazing day. Take care and best wishes to you and your family. Our big day was made extra special by Lee Live. My husband and I wanted more than just a dj and Lee delivered that. His singing, ceilidh dances and dj set and variety of songs had our guests up dancing the whole night, the dance floor was never empty. We couldn't have chosen anyone better for our special day and a big thanks to Lee for entertaining all our guests. I recommended Lee 100%, you won't be disappointed. Thanks a million Lee, you made our fairy tale. We booked Lee based on his excellent reputation, and yet he still managed to exceed our expections during the evening of our wonderful July 2012 wedding. We were married in Borthwick Castle, and his lighting show looked excellent in the historic venue. He's a nice guy, great with guests and it was a pleasure to work with him. The most important thing for my wife and I, was a modern mix of rock/pop/dance songs with a small set of traditional Ceilidh dancing. The selection was brilliant and kept the venue buzzing throughout the evening. We would highly recommend Lee. Thought we would just drop you an email to say many many thanks for all your DJing, singing and ceilidh calling at our wedding on Saturday at Dalmahoy. You wereabsolutely fantastic and you really kept the night time entertainment flowing. Everyone had a whale of a time and it was a real party spirit which was exactly what we wanted. Thank you so much and we will definitely recommend youif any one we know needs a top class entertainer. We just wanted to say a massive thank you for all you did at our wedding. Our guests commented on what a great night they had. The dancefloor seemed to be full all night - which was great. "Thanks so much for providing the disco at our wedding reception. We had a great time as did our guests, many of whom have commented that it was the best wedding disco they have ever been to - one couple even turned their taxi away twice so they could carry on dancing! We really appreciate you playing all of our song choices, even the pretty obscure ones, and it was great that you could download songs on the night. We would certainly recommend you to friends. Thanks again." Thank you so much for DJing at our wedding. Everyone had an absolutely brilliant time and had so much fun on the dance floor! The tunes were great and thedancefloor was never empty!! You did a great job! "Thank youSOOOOOOOOOOOOOOO much for playing at our wedding! You did an absolutely, utterly, FANTASTIC job.I cannot give you enough praise and I thank you from the bottom of my heart for really making the day so memorable." "We would like to thank you for making our day so special. We really couldn't have asked for a better DJ. Everyone commented on how great you were"
"Our night would not have been half as good if not for Lee Live, he was fantastic!!! If you need an entertainer he's the one"
"What a ball we had at our wedding reception, you made it a night to remember ensuring everyone was catered for and the dance floor was full all night. We would certainly recommend you to anyone who was looking for a fun filled night of quality entertainment and we have voted for you in the VOWS 2010 - good luck and thanks again"
"Just wanted to give you a massive thank you for the music at our wedding! Friends and family are still talking about the music and the set up and how well everything went - think never having an empty dance floor really says it all! and thank... you for ending our amazing day with AC/DC (Thunderstruck) - nobody can hear that song now without thinking about our wedding which is just great :0) We sent off our vote for the VOWS (2010) and will keep everything crossed for you - you really deserve it! Amazing day and amazing music!!! x"
Thank you for an amazing night, you made our Wedding reception go with a bang. All the guests enjoyed the night and commented on how great it was to have something different as reception entertainment. Your interaction with the guests and our selves proved a real high with everyone commenting on the personal touch that you gave. 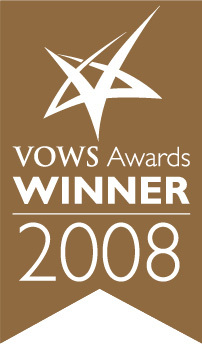 We are happy to recommend you to all our family and friends and hope to book you again in the future.We have voted for you for the Vows Awards 2009. The music kept everyone dancing all night. Good variety to hit everyone's taste. Live singing was excellent followed by disco and ceilidh music. A few dancing injuries the next day with having too much fun. I'd highly recommend - excellent value for money. We had the most amazing night and you really did make the day a wonderful event! Thanks for making our day so special, we are nominating you as one of the top 4 suppliers, from your detail into insuring our songs were all played to how approachable and friendly you were too all the guest, to not having the floor empty one minute of the night, it will always be remembered. Click on one of these links to post a review on the site.